The 180-day moratorium was instituted July 31 due to “an increasing number of requests regarding the placement of mobile homes” along the town’s lakes, according to the special town meeting warrant. The Planning Board has since been developing land use regulations regarding this type of housing. The Selectboard voted unanimously to extend the moratorium for another 180 days. At the meeting, the Selectboard also appointed Louise Lester, board secretary for the Zoning Board of Appeals and former town clerk, to the Zoning Board of Appeals. The Board then discussed its budget schedule and goals for the following year. The goals include, among others, “maintaining or lowering the tax rate” and “a continuing commitement to improve maintenance of town roads,” said Selectboard member Marshall Bullock. 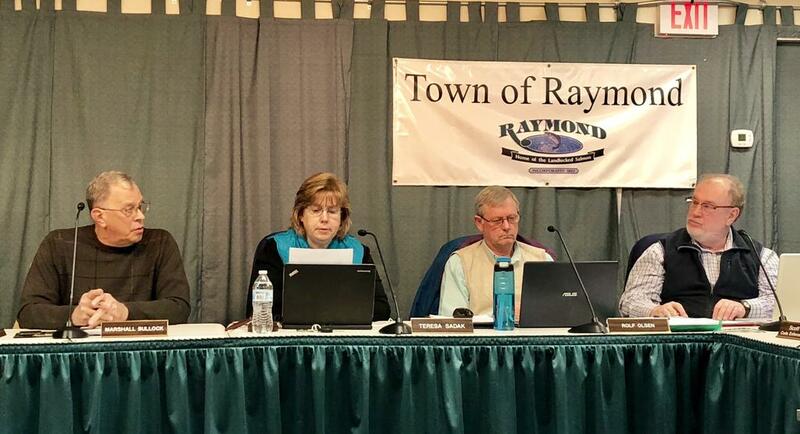 The Raymond Selectboard said it needed more time to work on regulations for manufactured homes. Chairwoman of the Selectboard Teresa Sadak listens to a presentation Tuesday.